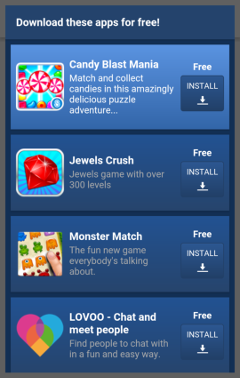 The AppBrain interstitial is the main way to generate revenue with the AppBrain SDK. The interstitial will show your users a list of apps they can install for free. Each app a user installs from the interstitial will generate revenue for you. Occasionally the SDK will show a pre-interstitial where the user is first asked if he’s interested in downloading interesting apps. The best moment to show the interstitial is at a natural pause moment in your app, for instance when an important event just has completed, such as sending a photo or finishing a game level, or when leaving the app. The easiest way to create an interstitial is using the InterstitialBuilder class. We recommend creating the InterstitialBuilder in your activity’s onCreate(), so it can start loading in the background. Then, for example in a view’s OnClickListener, you can show the interstitial using InterstitialBuilder.show(). Instead of calling show() you can also call maybeShow(). When using that method, the AppBrain SDK automatically makes sure the interstitial is only shown occasionally, which is why maybe is in the method name. Therefore it’s safe to call this method in multiple places without having to do your own rate limiting. If you want a specific action to happen after a user closes the interstitial, you can set an onDoneCallback in InterstitialBuilder. This callback is always called after you try to show the interstitial, also when the interstitial fails to load, so you can safely put the next step of your application flow in there. // publisher app on our dashboard under "Ad settings". // Preload again, so we can use interstitialBuilder again. To get a more detailed look at this example, see In-depth look at interstitials. This examples and more options are discussed in detail on the In-depth look at interstitials page.